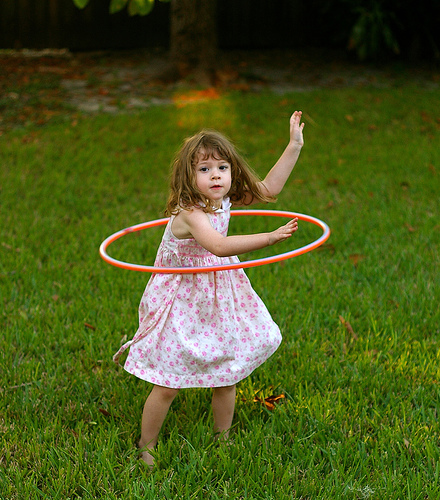 Hula hoops are great tools for developing physical skills, and they are lots of fun too! A preschooler probably won’t be able to use a hula hoop for its intended use yet, but there is still a lot they can do with one. Here is a list of games and learning activities for hula hoop time. Lay the hoop on the ground and use it as a target for a bean bag toss. Put a series of hoops on the floor, and have your child follow directions to hop from hoop to hoop. They can jump with both feet, step, hop on one foot, etc. Use a hoop as a round balance beam. They can walk one foot in front of another around the circle, or they can stand on the hoop with their toes pointing toward the inside of the circle and side step (step, together, step, together.) Side-stepping in particular is good preparation for many sports. Play a following directions game. Lay a hoop on the floor. Have the child stand inside, stand outside, put one foot in, put an elbow in, put any body part in, etc. Switch roles and let your child give you directions as well. Use the hoop like a jump rope, having the child hold one end of the hoop in both hands and jump into the hoop, then turn the hoop around over his head and in front of him again. This teaches jump rope skills before a child is able to master using a rope. Chase the hoop. The child rolls the hoop along the ground, running alongside it and using their hand or a stick to keep it going. Have the child hold the hoop in front of them like a steering wheel. They then try to throw the hoop over a parent’s arm. The beauty of this is that you can move if their aim is off. When they get good at this, you can graduate to throwing hoops over a stick stuck in the ground. And finally, when your child is ready to try hula hooping the original way, teach them how to hold the hoop around their waist with a hand on each side, and to pull it forward until they feel the hoop touch their back before they begin to spin it and wiggle their hips.